Being in Buckhead and desirous of steak, it seems only logical to visit the place in which steak is the signature item-and shares the name of the good doctor of Star Trek fame, Leonard “Bones” McCoy. There’s just no way for that to be bad. Even a place named Klingons might imply good meat, if not some issue with next day disposal of said product. Nonetheless we boldly strove into Bone’s. It was very packed for a weeknight. The atmosphere was classic 1960-70s steakhouse. The service was courteous and we were quickly seated (we did have a reservation). My dinner partner and I scanned the menu and ordered. The menu was as expected; featuring steak with some classics sides served “family style”. First course was lobster bisque and the crab and lobster napoleon with chardonnay cream sauce. The bisque was good; creamy, rich with a hint a sherry and well seasoned. The warm bread was soft and a tasty complement. The napoleon, I assume was “deconstructed” because it lay all over the plate. Perhaps a better analogy is demolished. The crab was clearly out of a container and the chardonnay cream was bland and very thin. But hey-it’s a steakhouse, right? Shame on me as I should have stuck with the beef appetizer. Let’s move onto the meat of the evening experience. I ordered the aged bone-in rib eye. My dinner guest had ordered the Wagyu strip steak. Wagyu, while not actually Kobe beef, is from the same breed that is used to produce Kobe beef and tends to be much more richly marbled, thus producing a juicer, more tender steak with superior flavor. The “sea breeze” potato was a baked potato. The spinach was properly cooked, if a bit under seasoned. Adequate, not spectacular. My steak was perfect; a 10 out of 10. It was cooked perfectly (medium rare) juicy as it had obviously been well rested with a perfect sear on the outside. It was tender, juicy and flavorful. When cutting into the steak (a nice about 1 ½ inch slab) there was very little grey at edge, just basically the sear then the perfect red-pink perfection. This indicates a knowledgeable grillardin. Unfortunately, he must have left his little retarded cousin cook the other steak-it was everything my steak was not. It too had been ordered medium rare. It was about half as thick as my steak. It was grey (well done) about 1/3 through from each edge with some pink in the middle. Where I come from that’s medium well. Pretty clear both steaks had been fired at the same time-rookie mistake. The Wagyu should have been scrapped and another re-fired halfway through the cooking of the first. If you run a steakhouse there is no excuse-this is what you do. So there you have it. I would say given the price of the steaks, you should not have to worry about hit or miss grill work. The upside is when it’s right, it’s great. When it’s wrong, you’ll just have to have Scotty beam you up-or re-order. Michael Fenster, colloquially known as Doc, is a Board Certified Interventional Cardiologist. Working professionally in kitchens prior to entering medical school, Doc maintained his passion for food and wine throughout his medical career. He is a certified wine professional & professional Chef (with culinary degree!). 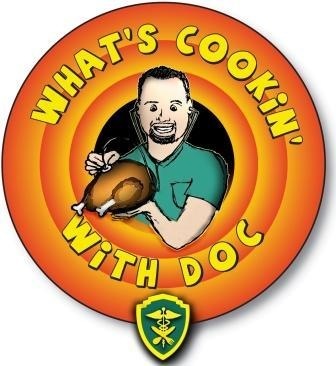 With a heavy hand in home cooking, you can find his musings on his blog, aptly named What’s Cooking With Doc. From time to time, he also updates his twitter account, so give him a follow.